The Magazine of Fantasy & Science Fiction. January/February 2012. Just after the end of the Great War, two lives come together. One is a man who returns to his devasted home town who copes with the changes by building a small-scale replica. The other is a tiny woman (and I mean tiny as in Thumbelina rather than a person of restricted growth). Whilst he wants to see the world as a smaller place than it is, she experiences it as a much bigger place, but it does not make for a happy relationship. Ron Goulart. The Secret of the City of Gold. Liu provides another dark story set during the Second World War in the Japanese theatre of combat, following his ‘The Man Who Ended History’ in Panverse Three last year (Best SF Review). The US is complicit in this story, sending an American-born young woman of Japanese descent back to a land that she has never seen, to act as a double-agent. Her expertise as a physicist are used to good effect in getting close to some experimentation involving the spirits of the dead. And the story gets grimmer as it progresses. Charming piece of fantasy meta-fiction as a mother tells (or tries to tell) her daughter the story of a dragon and a young girl, the details changes following comment by the daughter. John G. McDaid. Umbrella Men. Effective piece which looks at three generations of an American family who have an unusual role to play in keeping a balance in world affairs. Or, rather, who have temporary ownership of something that has that role. Michael Alexander. In the Trenches. The trenches of the First World War are made an even more horrific place to live, when man is put against man. K.D. Wentworth. An Alien Land. A frustrated, isolated suburban housewife is initially horrified when the house over the road, a bank foreclosure, sees some aliens move in. Aliens as in Aliens. However, she finds that whilst initially unfathomable, there is something about them and their welcome that may offer her a new lease on life. A neatly written short-short, that with a few deft touches takes the reader back to 1950 suburban America. Except that for some reason it isn’t 1950, although some have paid a price to get there. Confused? No answers in the story, so on the basis that a canto is part of a longer piece, roll on Canto MCMLI. A darkly humourous espionage thriller, with an FBI agent helping a mind-reading Russian to hide from forces who wish him dead. The agents coming after the mindreader find a lot more to content with in the shape of his new neighbours. Ted Kosmatka. The Color Least Used by Nature. A solid piece of world-building and characterisation, albeit with a fairly minimal fantasy element. Set on a Pacific island, we follow the life (and death) of a ship-builder, as we see his loves, his losses, his actions, and his mistakes. A ridiculously strong collection, with a good range of stories that draw the reader into their world. 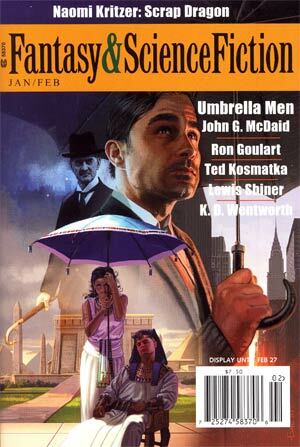 Lightspeed Magazine #22, March 2012.